Las Cruces is the county seat of Doña Ana County, New Mexico, United States. The population was 101,047 in 2012 making it the second largest city in the state, after Albuquerque. Las Cruces is the largest city in both Dona Ana County, and southern New Mexico. It is the principal city of a metropolitan statistical area which encompasses all of Dona Ana County and is part of the larger El Paso–Las Cruces combined statistical area. 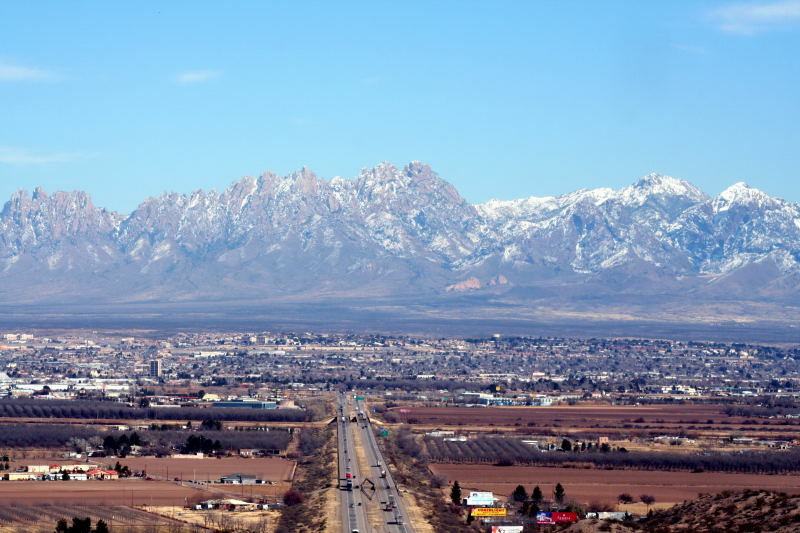 Las Cruces is the economic and geographic center of the fertile Mesilla Valley, which is the agricultural region on the flood plain of the Rio Grande which extends from Hatch, New Mexico to the west side of El Paso, Texas. Las Cruces is also the home of New Mexico State University (NMSU), New Mexico’s only land grant university. The city’s major employer is the federal government on nearby White Sands Test Facility and White Sands Missile Range. Recently the city has been home to many of the retired from across the country. The majestic Organ Mountains, ten miles (16 km) to the east, are dominant in the city’s landscape, along with the Doña Ana Mountains, Robledo Mountains, and Picacho Peak. Las Cruces lies 225 miles south of Albuquerque, New Mexico, 146 miles south of Socorro, New Mexico and 45 miles north of El Paso, Texas. Spaceport America, which lies 44 miles north of Las Cruces, has seen the completion of several successful manned, suborbital flights. The city is also the headquarters for Virgin Galactic, the world’s first company to offer sub-orbital spaceflights.